Someone’s watching . . .
Q: James, tell us about your series. Is this book a standalone, or do readers need to read the series in order? 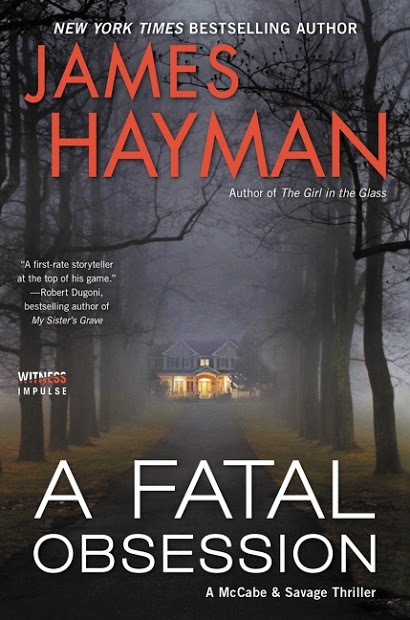 A: A Fatal Obsession is the sixth entry in the McCabe/Savage suspense thriller series. Each of the books can be enjoyed as stand alones. However some readers may enjoy the evolution from book to book of the relationship between the two protagonists, Detective Sergeant Michael McCabe and Detective Maggie Savage. A: I live in the wonderful small city of Portland, Maine. I call it wonderful because it boasts everything I want in a hometown: a vibrant urban feel, great restaurants, great architecture, terrific art and music scenes and it’s right on the water on Casco Bay. A: I was born in Brooklyn and grew up in Manhattan. When I was fourteen I was sent off to boarding school in Andover, MA. where I spent four years. So in a very real sense I can say I also grew up in New England. A: Getting married to a very special woman in a four hundred year old Anglican church in the tiny village of Penkridge, Staffordshire, England and driving off to the reception at my in-laws home in a 1937 Rolls Royce. A: An extra $100 would buy me a bottle of very, very good single malt Scotch Whisky. A: A $100 bottle of very, very good Scotch Whisky. A: Yes. When we first moved to Maine we lived right on the ocean in a house we had built on an island off the coast from Portland. On April 18th, 2007 the so-called Patriots Day Storm struck. Hurricane force winds and wild waves for over twenty-four hours. No power for nearly a week. The storm was officially declared a natural disaster. A: Drove from New York City to the end of Long Island in a driving snowstorm in an ancient VW Beetle. Ran out of windshield washing fluid about halfway and could only keep the windshield from freezing up by washing it with the contents of a bottle of vodka I had in the car. A: When I was a teenager I was convinced I knew just about all there was to know about life. I wish I knew then what I know now . . . that I knew next to nothing. A: If I’d known that I’d be able to sell the first novel I ever wrote to major publishers in half a dozen countries I would have started writing novels decades earlier. A: Long windy speeches from dull windy people at weddings, formal dinners, and/or endless business meetings. Happily, on these occasions I can usually retreat into my own world of day-dreams which is invariably more interesting. A: I’d like to start writing fiction earlier than I did. A: I’d give it to an organization like a homeless shelter or Doctors Without Borders or the National Resources Defense Council. A: We met on a blind date in London when I went there on vacation. We were introduced by a British girl I knew in New York. I think we both knew we had something special right from the get go. We spent about three days together in England before I had to head home to New York. But, after I got back, I wrote her and asked her to come visit me in NYC. To my amazement she agreed. The rest, as they say, is history. A: Two watches inherited from my brother who was much older than me and who died far too young from cancer. A: “It is cold at 6:40 in the morning of a March day in Paris and seems even colder when a man is about to be executed by firing squad.” Day of the Jackel by Frederick Forsyth. A: “Outside of a dog a book is man’s best friend. Inside of a dog it’s too dark to read.” –Groucho Marx. Q: That's one of mine, too! What would your main character say about you? A: How in the world did somebody as goofy as you dream up somebody as cool as me? A: Ernest Hemingway, F. Scott Fitzgerald, Kate Atkinson, Donna Tartt, Dennis Lehane, Michael Connelly, and Ian McEwan. A: Fatal Vision by Joe McGinniss. I’m reading the ebook version. A: A font too small for my aging eyes. That’s why I usually read on a Kindle. I can make the font as big as I want. A: In the morning in the quiet room at the top of the University of Southern Maine library. It’s comfortable, quiet and a five-minute walk from my house. 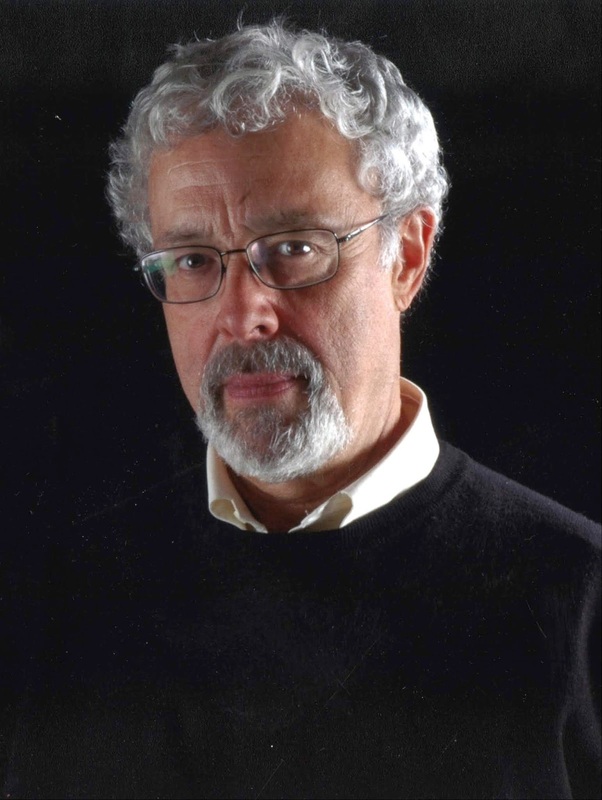 A native New Yorker, James Hayman worked for Madison Avenue advertising agencies for over 30 years before moving to Portland, Maine to continue his writing career. His first thriller, The Cutting, was published in 2009 and introduced Portland detectives Mike McCabe and Maggie Savage to mystery fans. Four more McCabe/Savage thrillers followed garnering great reviews and landing Hayman on the New York Times, Wall Street Journal and USA Today best-seller lists. James currently lives in Portland with his wife, artist, Jeanne O’Toole Hayman and their rescue cocker spaniel, Pippa. 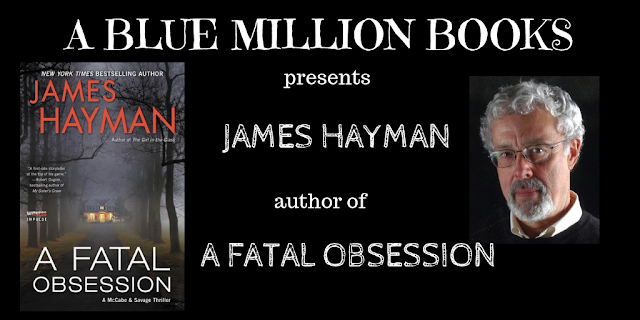 His 6th McCabe/Savage thriller, A Fatal Obsession, came out August 21st and, according to NYT #1 bestselling author A.J. Finn, “A Fatal Obsession is (Hayman’s) finest to date: a ferocious live-wire thriller starring two of the most appealing cops in contemporary fiction."